Promote your mobile keywords in all of your existing advertising to get sign-ups and record opt-ins from customers. They are then added to a distribution list automatically, so you can send them messages about new products, sales events, and more. Trumpia’s intelligent solution can even ask these customers qualifying questions so you can send more targeted offers. For instance, when a new customer texts in your keyword, our system can ask them “What is your favorite clothing brand?” Their answer will be recorded, and when you have a sale on that brand you can send all interested customers information about the sale and a coupon to further entice them to come to your store. Turn around a slow day with mobile coupons, which are redeemed ten times more often than paper ones. And with our automation, you can even have a reminder sent when a customer’s coupon is about to expire. You can even schedule your coupons, so if you are traditionally slow on Tuesdays you can automatically send coupons to customers in order to drive them into your store or purchase online. With Landline texting, customers can call or text the same number with questions about products or complaints. This is especially great for customer service, with 60% of consumers saying they would prefer to text over call because nobody wants to risk playing phone tag, getting stuck on a long call, or emails getting buried in their inbox. This also allows your staff to handle multiple requests at the same time instead of being stuck on long phone calls with just one customer. A sports supply store could give VIP customers early access to their Black Friday sale via text. In an automated text, the store would ask if the customer is a fan of A) Soccer, B) Basketball, C) Football, or D) Golf. Depending on the customer’s response, they would be sent a link for exactly what they’re looking for. Keeping up with scheduling can be a huge headache. Texting helps solve this by allowing you to instantly communicate with staff about shift assignments or job priorities, even when they’re on the go. Plus there’s no better way to fill in a missed shift than texting all of your employees asking if they want to pick up more hours in order to fill a last minute cancellation. 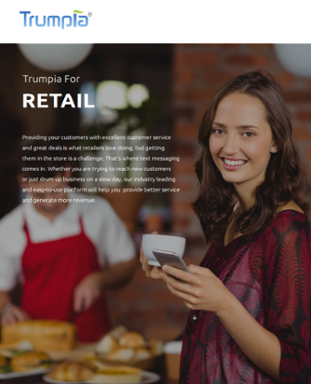 These are just a few ways Trumpia helps with retail business. We also offer consulting services and have an amazing support team ready to help 365 days a year. Download the Retail Brochure for FREE!